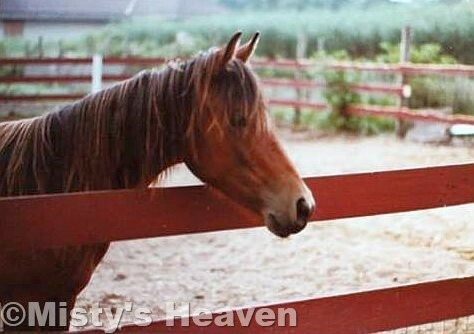 Mugwah was the sire of Stormy's last foal Foggy Mist. Foggy Mist was the result of an accidental breeding between the two. Very little is known about Mugwah, but a picture of him has been uncovered and we now know that he was a bay. Given Foggy Mist's birthyear of 1978 Mugwah likely sired the rest of that year's Pony Farm foal crop: Gale out of Windy, Sea Breeze out of Breezy, Gusty out of Misty II, and Raindrop out of Rainy. It is also likely that he sired other foals at the Pony Farm.